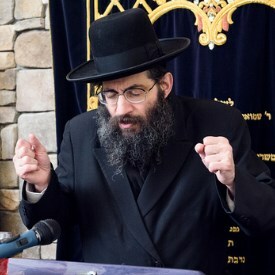 A child prodigy and grandson of Rabbi Gedalia Schorr zt”l (known as the ga’on of the Slabodka Yeshivah), Rabbi Zilberberg is known for his extreme diligence, spirited davening, and tremendous thirst for learning. Since his years as a bachur until the present, he has enjoyed a close relationship and weekly meetings with the Amshinover Rebbe shlit”a. He has a weekly Shabbos seudah shelishis that lasts for hours at a vey high level of dveikus. Hundreds of people-chareidim, dat leumi, and chilonim come to bask in the unique ruach. Rabbi Zilberberg was instrumental in the founding and leadership of Nachlas Yaakov, where he serves as the Rebbe and rosh chaburah.